Rugby Awareness – A new course piloting at the moment around the area. It is for parents and coaches and will be held on 2nd November at the Club from 6.30pm to 7.45pm. 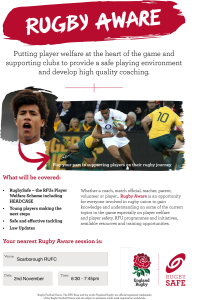 The idea is to allay any fears parents may have with regards to the safety aspects of rugby.